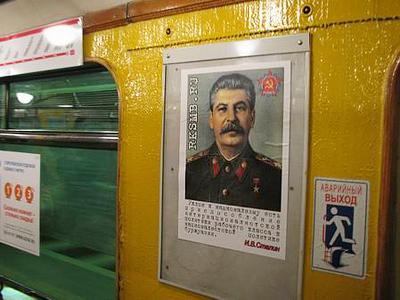 Posters with images of Joseph Stalin have appeared in St. Petersburg Metro carriages. Earlier, a bus bearing the portrait of the Soviet leader was seen on the city streets, despite the controversy surrounding the idea. ­The posters are signed by the Revolutionary Communist Youth Union, but the organization denied any connection to the action. However, on their website they said it was carried out by their anonymous supporters, who called them to inform about it. Young Communists were not against the initiative. Quite the opposite. “It is a response in the best traditions of materialistic dialectic to all those smart guys who are burdened with pseudo-Stalinist complexes and cliches,” reads the statement on the website. As for the Stalin bus, it is now running in St. Petersburg’s historical center, on some of the busiest streets. The initiative comes from a well-known blogger Viktor Loginov (viklamist). On his LiveJournal blog, he wrote that it is his private initiative and has nothing to do with politics. The only goal is to celebrate Victory Day with the residents of the city, he says. “Our stance is simple. We do not aim to embellish Stalin, we are not trying to clean his image of the crimes ascribed to him, be it real or imaginary. We only want to underline his key role in the common victory over the deadly enemy of our state and all peoples of the USSR,” the blogger wrote. City authorities are indeed in no way related to the bus ad. In fact, they are planning to withdraw the bus from the city streets for violating the rules. Loginov admits he signed a contract for placing the Stalin portrait with a local transport company called “Network of Passenger Traffic”. He is considered an advertiser in this case. Formally, he is not breaking any laws with his actions and the image of Stalin is not banned in Russia. The problem is with the company, which has no agreement with the city authorities for the transportation of passengers and, consequently, is subject to administrative punishment. Earlier reports that Stalin buses, or Victory buses, may appear on the streets of Moscow and several other large cities sparked controversy in society which remains divided over the personality of Joseph Stalin and his policies. The majority of the population believes his bloody repressions which claimed millions of lives cannot by justified. There are some, though, mainly Communists, who say that Stalin played a key role in Soviet history and built a powerful industrial state. 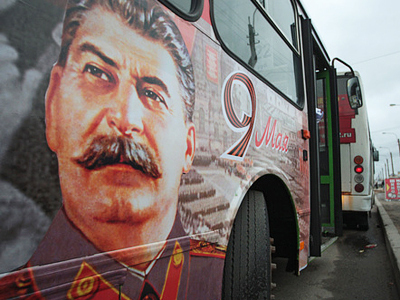 At the end of April, Mosgortrans, a company operating transport in Moscow, said that it was not behind the idea and there will be no Stalin portraits on their buses. 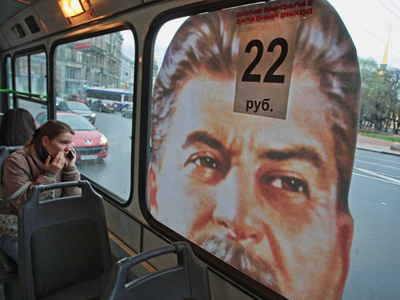 Last year an image of Stalin appeared on a St. Petersburg bus, outraging human rights activists. On the same day, unknown individuals painted over the portrait. This time local human rights activists, including State Duma deputy, former political prisoner Yuly Rybakov also condemned the ad.